Shanghai (AFP) – Unable to afford a car, Shanghai university student Long Yi faces a lengthy, expensive commute across his vast city but has found a solution in the car-sharing schemes quickly gaining momentum in China. Essentially an Internet Age twist on car rentals, car-sharing is growing rapidly from virtually nothing two years ago as Chinese millennials seek more mobile lifestyles without the cost and hassle of buying cars. 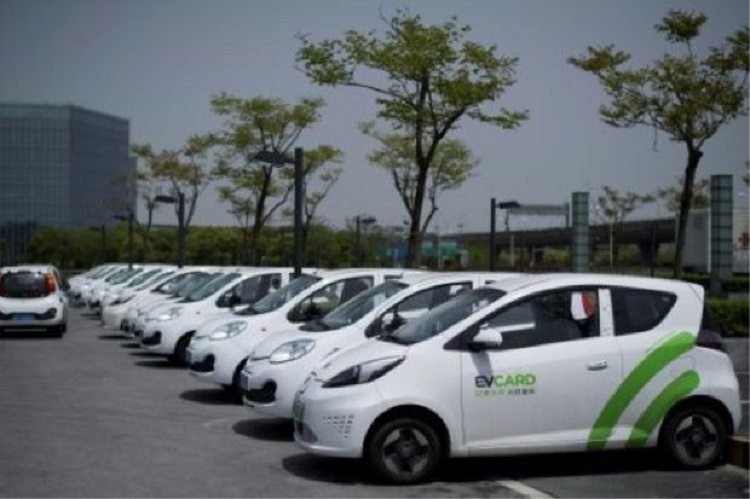 Long, 20, drives himself to school for around 50 yuan ($7) using EV Card, a service launched by state-owned automaker SAIC Motor that offers compact electric vehicles sprinkled around the city, slashing his travel time and at one-quarter the cost of taxis. “It is cheaper and more convenient and very flexible. I would choose EV CARD as my primary way of transportation almost every time,” said Long. After years of skyrocketing sales, the global auto industry is contemplating a sales slowdown as it convenes this week for the Shanghai Auto Show, putting alternative sales channels like car-sharing in focus. Long-established in Western countries, car-sharing schemes are relatively new in China, but are a growing component of an ongoing Chinese personal-mobility revolution. Drivers typically use a smartphone app to find and even unlock cars, later parking them anywhere or at set locations. Already, bike-sharing businesses have exploded across China, flooding major cities with bicycles that are unlocked by GPS using an app, can be left anywhere and have become critical to the commutes of countless Chinese urbanites. Dozens of Chinese and foreign companies have now either launched or invested in car-sharing businesses, with some making purpose-built cars. “That is a significant growth opportunity (for manufacturers). There are only a few hundred thousand cars now, but it’s growing and it’s growing very quickly,” said Johan Karlberg, a Shanghai-based partner with Roland Berger. German giant Daimler launched car-sharing services in the southwestern city of Chongqing a year ago and has since expanded to six other cities, with more than 250,000 registered users, the company said. Jochem Heizmann, China CEO for Volkswagen, the country’s top car brand, told reporters Tuesday VW was close to cementing a partnership with Chinese car-sharing operator Shouqi serving multiple cities — partly to boost sales of VW electric vehicles. “You have to see the development of such fleets as sales channels,” he stressed. Some models are emerging with sharing features installed. Lynk & Co — a new subsidiary of Chinese automaker Geely, which owns Volvo –- will unveil in Shanghai an SUV with electronic features that facilitate “sharing” the car to other drivers for a fee, much like renting out a flat on AirBnb. “These types of services will grow to the extent they change to a degree the type of car you build,” said Bill Russo, head of Shanghai-based auto consultancy Gao Feng. China’s central government and many local authorities are keen to reduce congestion and air pollution and have dangled various financial incentives, including eased licensing requirements, guaranteed parking, and other inducements. Further working in car-sharing’s favour, countless Chinese face significant hurdles to car ownership, including cost, scarce parking, and limits on car use in several major cities. By 2020, China will have just 195 million cars for 355 million licensed drivers, Roland Berger estimates. “Many middle class families that can afford a second car are opting not to. It’s a real hassle,” said Karlberg. The problem, say analysts, is that high start-up costs and other hurdles in the fledgling industry mean that no one is making money yet. But they add that within the next two years the growing numbers of industry entrants will likely consolidate into a solid few able to run sustainable business models in partnership with local authorities.